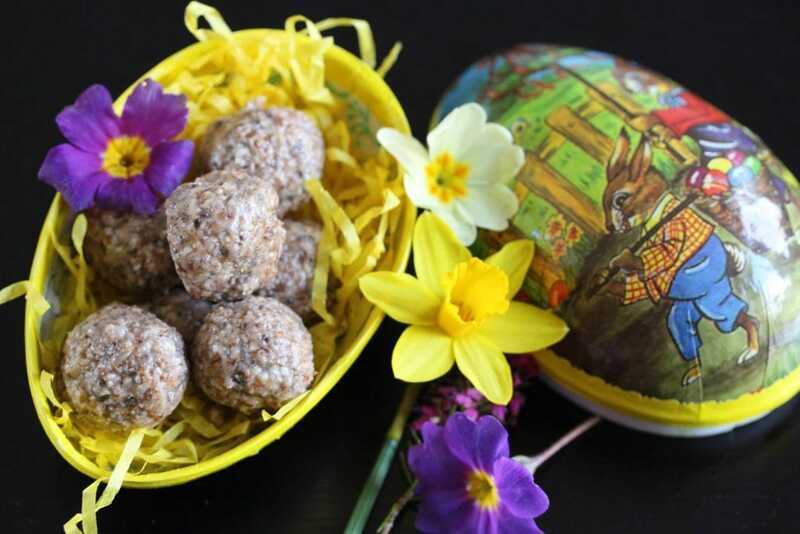 Bliss Balls: The Hot Cross Bun Version | The Free From Fairy. We’re big fans of bliss balls here. For those of you who don’t know what they are then let me explain. They’re a super simple, no bake, no fuss sweet treat made from a combination of nuts, seeds and dried fruit. They travel well so are perfect for lunchboxes or as a small after dinner treat. Being made from dried fruit, nuts and seeds they also contain vital fibre and healthy fats. Although they have no added sugar in them, be mindful of the fact that dried fruit is very high in fructose. When we consume too much fructose the liver converts it into fat. Not only that but many scientists believe that by over consuming fructose we are putting ourselves at risk of type 2 diabetes, obesity, heart disease and even cancer. However the combination of dried fruit and fibre rich nuts and seeds helps lessen the impact on blood sugar levels. The fibre allows the sugar to be absorbed more slowly. 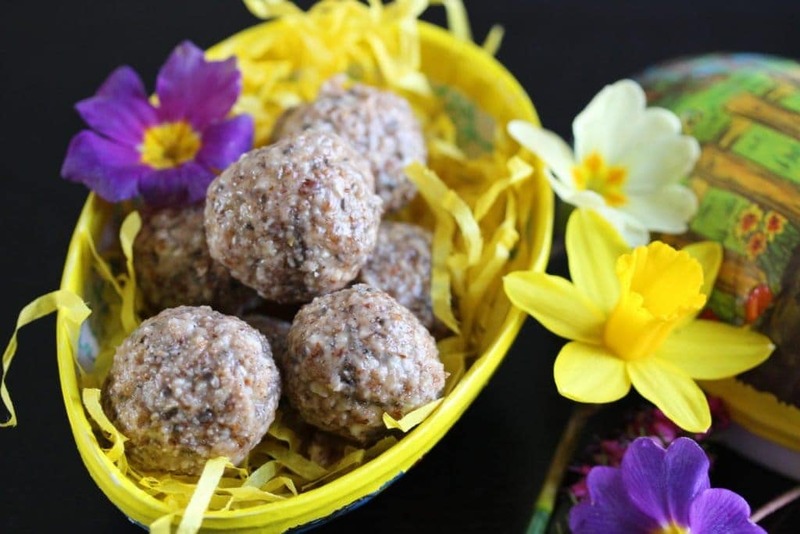 Eating a few of these bliss balls is certainly a better option than a few hot cross buns! As Easter is rapidly approaching I decided to make these bliss balls hot cross bun flavour. By changing the spices you can create whatever flavour you desire. Just use my recipe as the basis to your own. Or if you prefer, you could try my fresh fruit bliss ball recipe here. 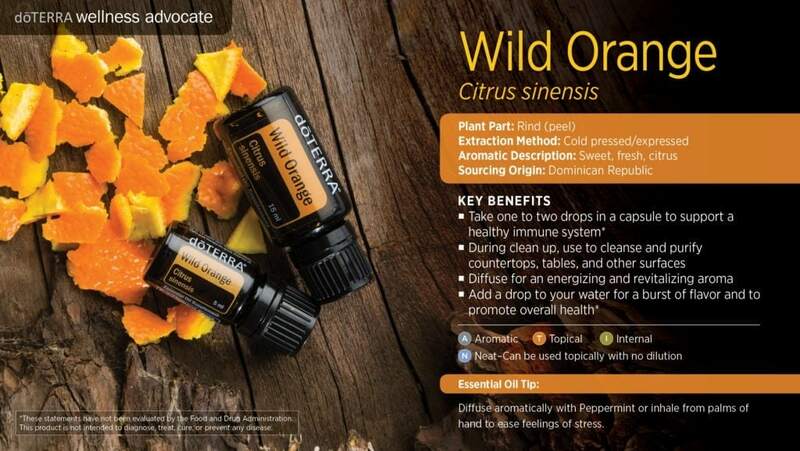 I’ve used some doTerra wild orange essential oil in the recipe. Wild orange essential oil has a variety of uses from energising and stimulating the mind to aiding digestion. It has a wonderful aroma and the rind, from which the oil is extracted, is full of antioxidants. If you don’t have a high quality essential oil that is certified for therapeutic benefits then use orange extract instead. Do not use an essential oil that you bought from other sources unless you have thoroughly researched that it is safe to ingest (many oils contain fillers, toxins and artificial aromas). 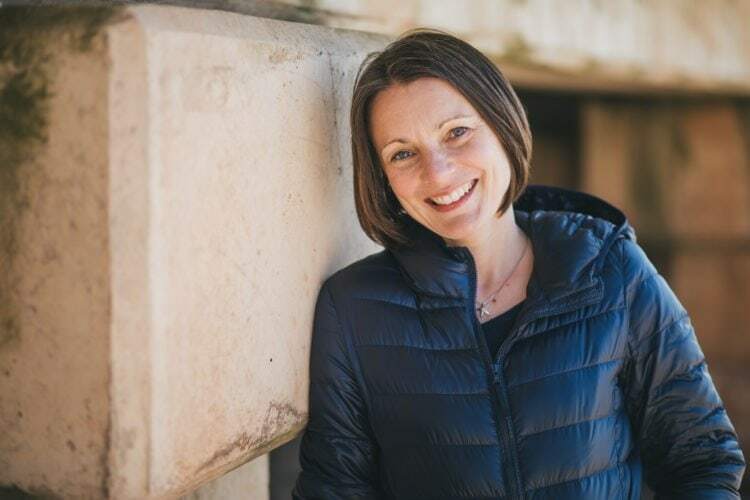 If you’re interested in finding out why I use and sell doTerra oils then check out this Facebook Live video (sorry about the quality my internet connection was clearly playing up). Do get in touch if you’d like more information or would like to buy them. Anyway, without further ado I present my bliss balls for #FreeFromEaster 2018. Wonderful Idea Vicki to add the orange oils…I adore orange flavour in recipes and these are just what I’m looking for to help me with those inevitable 3pm drops in blood sugars and energy levels whilst still being healthy – Perfect! What a brilliant idea Vicki – these sound amazing, wish I’d thought of it! Thanks Mandy. They are rather moorish! What a wonderful idea to incorporate orange oil in them, they sound absolutely lovely. 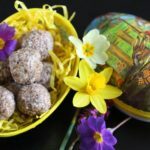 These look divine, we are big fans of bliss balls too and I love the idea of the flavours you’ve combined. Hope you had a lovely Easter. Thanks Laura. I hope you like them!